Nuclear power has been hobbled by safety concerns and cost overruns, but it remains one of the only proven ways to generate carbon-free electricity on a massive scale. Nuclear power plays an important role in electricity generation across the world, and over 443 nuclear power plants are in operation. In Canada, nuclear is important in Ontario's industrial heartland and supplies over half the province's electricity. There are currently no nuclear power plants in Western Canada: The B.C. government has prohibited power nuclear plants and uranium mining. Over the border, Alberta's government is considering proposals to use nuclear energy to help extract oil from the tar sands. The nuclear power station at Cattenom on the French side of the Franco-Luxembourg border. The plant hosts four 1,300 MW reactors. The basic workings of nuclear power are fairly straightforward: A nuclear reactor produces energy by nuclear fission , the splitting of atoms, usually uranium, which creates an immense amount of heat. This, in turn, heats water into steam that in turn runs an electricity generating turbine. Although in the early days of its development during the 1960s and 1970s, nuclear power plants were built rapidly, public attitudes to it have cooled. Since the Chernobyl nuclear meltdown in 1986, few new nuclear power plants have been built and there has been staunch opposition to any new plant proposals. The situation is not static though. Instability in fossil fuel prices and concerns about global warming have driven a renewal of interest in nuclear power among policy-makers and investors. Nuclear power is a viable fossil fuel alternative because a nuclear reactor emits no carbon and nuclear power is as carbon friendly as wind or geothermal power. However poor economic conditions, low public support and most recently the crisis at the Fukushima plant in Japan have made any resurgence of nuclear power difficult to realize. The German government, in direct response to the Fukushima accidents, has announced it will close all their nuclear plants by 2022. German Chancellor Merkel believes her country can replace the 23% of power that nuclear power already provides in Germany by up-scaling renewables such as wind and solar. Many analysts suspect in reality Germany will just have to import nuclear-derived electricity from France. Though negative public perceptions about nuclear safety are not entirely deserved, the nuclear industry can never offer a complete guarantee against another nuclear accident. Nor has it satisfactorily dealt with the radioactive waste that nuclear power plants produce. There are also limitations on the amount of minable radioactive ores, and geopolitical issues associated with this as well. These challenges must be properly addressed in the near future if nuclear power is to continue to play an important role in the global economy, though technological developments in nuclear power plants over the next 20 years can reasonably be expected to solve many of these problems. Even more exciting, scientists are continuing development on plants that can harness the nuclear process that fuels stars, fusion. The holy grail of energy research, it is thought fusion may be able to provide unlimited, safe and clean energy--virtually forever. All this means that at present nuclear power's role in the 21st Century remains uncertain. Nuclear power begins with the mining of a reactor's fuel: uranium. Uranium is a naturally occurring and relatively commonplace metal—there is about as much of it around the world as tin. Uranium will occur in ores with a grade that can be as high as 20% in some cases, though it can be economical to mine ores with grades as low as 0.02%. Once uranium is extracted from the ground, either from an underground or a surface mine, it must go through a complicated refining process. Most mines use on-site crushers to grind up the ore and use a combination of sulfuric acid, settling tanks, and ion exchangers to separate uranium from rock tailings. The result is a precipitate of uranium, which, when dried, becomes a uranium oxide (U3O8). This uranium is not enriched and only mildly radioactive. It is known as yellowcake. At this stage, most nuclear reactors in the world require that the mined uranium must be enriched, so that the fissionable U-235 isotopes go from their naturally occurring 0.7% to around 20%. Before enrichment can take place, the yellowcake must be converted into a gas: uranium hexafluoride. Now the uranium is ready for enrichment. Enrichment involves using rapidly-spinning centrifuges which can separate out the heavier uranium-235 atoms. Enrichment is expensive, adding up to about half the total cost of nuclear fuel. Once uranium has been enriched it is ready to undergo nuclear fission. 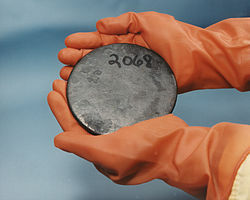 A billet of highly enriched uranium that has been reprocessed from spent fuel. Nuclear fission is the splitting of unstable atoms, typically uranium, though some power plants use plutonium. Though most uranium is U-238 and is not fissile, about 0.72% of uranium atoms are unstable U-235. If an atom of U-235 collides with a neutron it will split into two new atoms, releasing a large amount of energy and two neutrons. This process occurs naturally, giving off radiation, but when it is sped up by enriching natural uranium to contain a higher proportion of U-235, in the right conditions it can become a self-sustaining chain reaction that releases tremendous amounts of thermal energy. How is this heat harnessed by a nuclear reactor? The example we will use is a Boiling Water Reactor (BWR), the second most common type of reactor in the world and the primary reactor used in the United States, Japan and many European countries. For more information on the other reactor types, and Canada's own reactor design the CANDU, we will soon be adding a new supplementary article. Usually uranium is enriched with U-235 to form around 20% of the nuclear fuel. This uranium fuel is manufactured into small pellets that are themselves arranged into bundles of fuel rods. Typically the fuel rods will be submerged in water inside the reactor core. This serves three purposes. 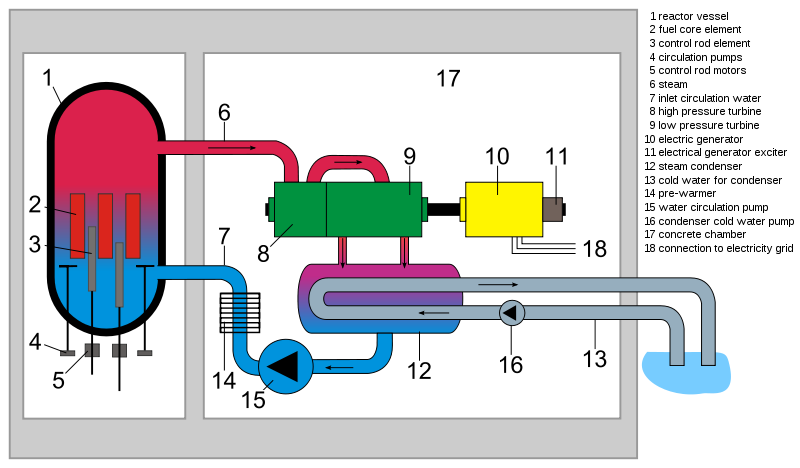 A schematic illustrating the Boiling Water Reactor, the most basic reactor configuration and the second most popular around the world. First the water can act as a moderator. A uranium atom needs to be struck by a neutron in order for nuclear fission to occur, but most of the time neutrons are moving too fast to react with a uranium atom. Water slows down neutrons, moderating their speed. The neutrons pass through the water between the fuel bundles, are slowed down, and able to react with other U-235 atoms. Secondly, the water is a coolant. It is imperative that the reactor stay submerged in water to help cool the fuel bundles, otherwise they would overheat and melt. This is a nuclear meltdown, and can lead to the uranium fuel burning through the floor of the reactor and exposing dangerous radiation to the outside environment. Reactors have a number of safety precautions to prevent meltdowns from happening, but meltdowns have occurred several times in the fifty years of civilian nuclear power use. It was once thought that the nuclear fuel, if left uncooled, would get so hot it would continue melting into the ground and pass through the entire earth, reaching China, hence the name China Syndrome. This is of course absurd, but exposed nuclear fuel rods do pose a grave risk to those around them. .
Thirdly the water is boiled off, and the steam is used to spin a turbine. That turbine is connected to a generator which generates electricity. Fukushima I reactor seen from the air during the 1970s. Reactors 1-4 are seen on the left, 5 and 6, under construction, are at right. Response efforts to contain the partial nuclear meltdowns continue. Nuclear power plants can be built essentially anywhere they can access the large amounts of water needed for cooling, anywhere from 95,000 to 227,000 litres per MWh of power generated. This could be from a river, a lake, or along the coastline. Logically, this would make British Columbia well-suited for nuclear power, but hydroelectric power currently satisfies the province's base-line electricity needs. One geographical issue that has come into sharp focus in the aftermath of the Japanese earthquake and tsunami are the threat that natural disasters pose to nuclear facilities. The Fukushima 1 nuclear accidents in March 2011 resulted from the cascading failures of a number of fail-safes intended to prevent nuclear meltdown. 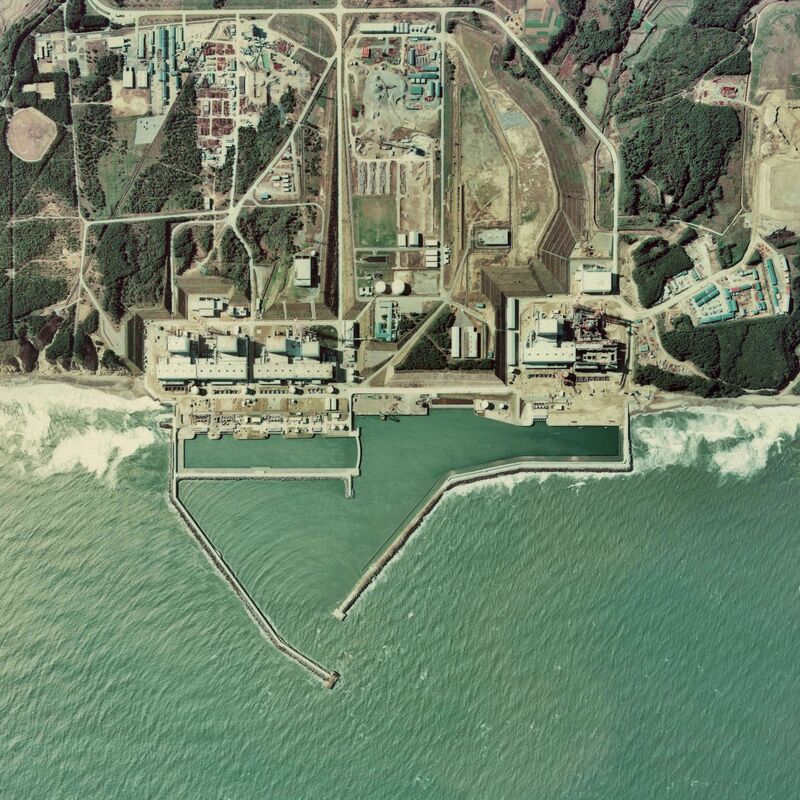 Many nuclear reactors are built in earthquake-prone areas, especially in Japan, and many are built at the water's edge. Though Japan's plants have operated without serious accidents since the 1960s, they can be uniquely vulnerable to the one-two punch of an earthquake and tsunami. Over a dozen countries including China, Switzerland and Finland are reviewing their safety precautions in light of these events. Germany has already announced it will close all of its nuclear power plants by 2022 as a direct result of the events at Fukushima, though the geographical conditions that led to the Fukushima disaster do not exist in Germany. Is nuclear power economical? The answer depends largely upon the market conditions. As a general rule, nuclear power plants are more expensive to build and decommission than other power plants, but less expensive to operate. While the price of all the fossil fuels have risen in the past fifteen years, uranium has become cheaper even than coal. The true costs of nuclear power lie in the plant's construction. For its weight, uranium is comparatively expensive. To mine the uranium ore, convert it, enrich it and fabricate a kilogram of reactor fuel costs about $2,500. Although that might sound expensive, a kilogram of enriched processed uranium can be used to generate more energy than any other substance yet harnessed by mankind—about 360,000 kWh per kilogram, 20,000 times more energy than a kilogram of coal. Taking the fuel alone, the price of nuclear power is about 0.77 cents per kilowatt hour. Including operating and maintenance costs, this rises to just over 2 cents per kilowatt hour, which is far cheaper than any fossil fuel form of power, as evidenced by this graph. As a general rule, nuclear power plants are more expensive to build and decommission than other power plants, but are less expensive to operate. In comparison with coal, nuclear fuel is more compact, the mining operations are not as vast and intensive (and potentially less environment disruptive), the ore is easier to transport, and since the fuel is only a small part of the cost of providing nuclear power, it's not as vulnerable to major price fluctuations. This final advantage makes nuclear power attractive amid ongoing supply challenges and cost increases in fossil fuel markets. Spent uranium fuel can also be reprocessed and reused as fuel in certain types of reactors. Just like any other finite resource however, uranium deposits are limited and will eventually be exhausted. However, at current consumption rates uranium reserves can be expected to last about 230 years. We can also reasonably expect that new extraction and enrichment technologies can extend this time considerably. A near-term shortfall may be looming as supplies of uranium from decommissioned Russian and American nuclear weapons, which accounted for 44% of all nuclear fuel used in 2007, are expected to be fully utilized by around 2015. This has given some incentive to exploration and mining companies to make up for the shortage. Uranium deposits are also not located uniformly around the globe, which can lead to geopolitical tensions between countries that possess uranium, and those who do not. This is not currently a serious issue as there are deposits on almost every continent and no major economies have yet found themselves cut off from supplies of uranium. The OECD countries have friendly suppliers in Canada, Australia, Niger and Namibia, while Russia and Kazakhstan's production is relied upon by China, India and Russia. The economic problems with nuclear power revolve around plant construction, technical expertise, waste and reprocessing, and legal hurdles that nuclear energy faces in many countries. For starters, nuclear power plant proposals in OECD countries must address local concerns in extensive consultation and regulatory processes that can dissuade potential investors and projects. Once construction begins, extensive safety measures, back-up equipment and special materials that ensure the highest levels of safety possible add considerably to capital costs. This also means a new plant can take up to a decade to license and build. A new generation of nuclear power plants is on the board in the U.S. But the projected cost is causing some sticker shock: $5 billion to $12 billion per plant, double to quadruple earlier rough estimates. Part of the cost escalation is bad luck. Plants are being proposed in a period of skyrocketing costs for commodities such as cement, steel and copper; amid a growing shortage of skilled labour; and against a backdrop of a shrunken supplier network for the industry. To compare, a new 1,000 MW coal-fired power plant can be brought online for around $1 billion. Though nuclear fuel is comparatively cheap (on a per kWh basis) and relatively abundant, the plant itself is time-consuming to build, unpopular with the public, and difficult to put an accurate price tag on. Historically nuclear power plants have been prone to cost overruns and delays. The Darlington nuclear power plant in Ontario is cited internationally as a example. Started in 1980, it was only completed 13 years later approximately 300% over budget at a final tally of $14.4 billion. 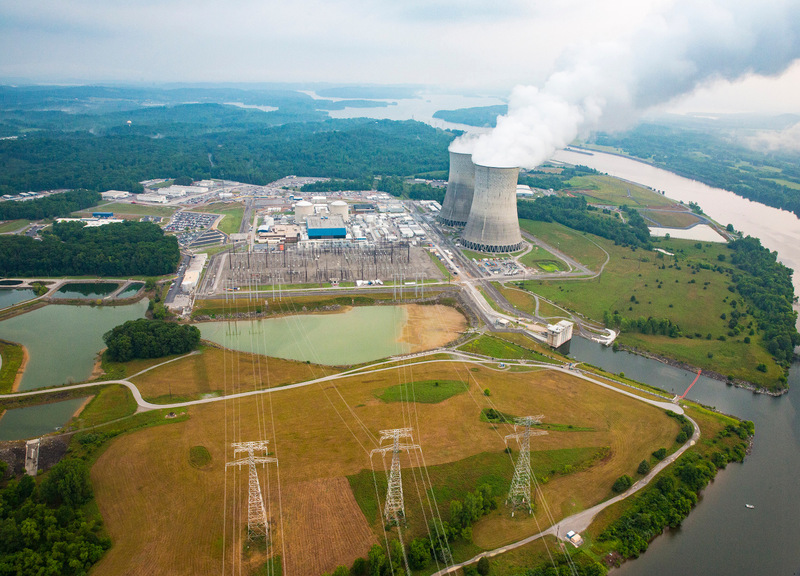 A changing utilities market is also complicating the expansion nuclear power. To make a nuclear power plant an attractive investment, there must be a guaranteed market to justify the massive up-front price-tag and long-term logistical effort. These conditions were satisfied in the 1970's and 1980's as government-owned utilities exercised monopolies. Today many jurisdictions are increasingly privatizing their power companies and opening up the private sector market to competition and investment. In this atmosphere, it is difficult to convince investors of the appeal of spending $10 billion for nuclear power plant project that will come online in a decade. This contrasts with a competitive coal-burning plant that can be built and put in operation in a fraction of the time. Finally after the nuclear plant is constructed, large sums of money have to be set aside for safely dealing with nuclear waste and eventually decommissioning the plant after it runs through its life-span, usually around 30 years. In the United States the Nuclear Waste Fund, paid by electric utilities that use nuclear power, runs to nearly $750 million a year. 'International Atomic Energy Association.' 50 Years of Nuclear Energy Factsheet, accessed May 19, 2011. http://www.iaea.org/About/Policy/GC/GC48/Documents/gc48inf-4_ftn3.pdf. 'Keith Johnson. 'It's the Economics, Stupid: Nuclear Power's Bogeyman.' Wall Street Journal. May 12, 2008. World Nuclear Association. 'Economics of Nuclear Power.' Last modified March 9, 2011. http://www.world-nuclear.org/info/inf02.html.. The environmental factors involved in nuclear power are perhaps more complex and controversial than the economic ones. Nuclear power is often touted as a necessary part of any climate-change fighting strategy because a nuclear reactor has a very small carbon footprint. But if we factor in the carbon emissions associated with the plant's construction, the mining and processing of the uranium, does the footprint increase substantially? And does a correctly operated plant pose a threat to human health? What happens when a catastrophic meltdown occurs like at Chernobyl or Fukushima? And can the vexing problem of nuclear waste ever be solved? Let's examine each of these questions in turn in order ascertain nuclear power's real environmental credibility. It is clear that given the enormity of the task of dealing with climate change, a number of carbon-mitigating measures are going to be needed, and though controversial, nuclear power must be considered. The UN's Intergovernmental Panel on Climate Change says that over its entire life-cycle a nuclear power plant will emit a similar amount of carbon to renewable energies (40 grams of carbon -eq/kWh) and therefore nuclear is "an effective [Green House Gases] mitigation option, especially through license extensions of existing plants enabling investments in retrofitting and upgrading." A study by the Swedish utility Vattenfall comparing the CO2 emissions of different forms of energy over their lifetime. Since building the plant, mining and enriching the uranium, and dealing with the nuclear waste are all activities that emit carbon, you may wonder how a nuclear reactor could possibly emit a comparable amount of carbon over its life-span to say a wind turbine. The difference is the scale. A typical nuclear power plant generates around 1,000 MW of electricity. Today the largest wind turbine in the world, at 198 m tall (about the same height as the tallest building in B.C., the Living Shangri-La in Vancouver), generates about 7 MW of power. Replacing a single nuclear reactor would require building 142 of these massive wind turbines, a fairly carbon intensive undertaking in itself. And this is not including capacity factors, which means that since the wind is not blowing all the time, in reality about three times that many turbines would be necessary to constantly be able to generate 1,000 MW. 450 enormous wind turbines vs. one nuclear power plant. It should be noted that these total life-cycle carbon estimates are controversial and other studies exist that put nuclear power on a much lower equal emissions footing with renewable energies. Given the state of development of the other renewables (we encourage you to read all the articles on energybc.ca) the conclusion is inescapable: If civilization is to undertake a serious effort to fight climate change, then nuclear power must be given a chance. We should note that most humans are exposed to some amount of nuclear, or ionizing, radiation on a regular basis. The average North American annually receives a dose of approximately 360 mllirems of radiation, primarily from cosmic rays. This is the equivalent of 36 plain chest or dental X-rays each year. Medical imaging is a significant source of the dosage, but low, yet continual doses can be emitted from natural substances, e.g., in rocks, soils or radon gas. Many manufactured goods, such as paper, clothes and even food, can have radioactive elements in them that emit radiation to which we are exposed. The lowest radiation dose that is thought to be a health threat is about 100 mSv in a year, which can cause a slightly heightened risk of cancer later in life. The average person living within 80km of a nuclear power plant is exposed to around 0.0001 mSv a year that can be attributed to the plant. Most people are exposed to about 0.28 mSv a year from cosmic rays. Ironically, some coal-fired power plants can emit 100 times more radiation into the surrounding air than a nuclear power plant. This is due to the presence of radioactive materials that naturally occur in coals that are released after burning as fly ash into the air. A correctly functioning nuclear power plant poses no threat to public health. The only site to result in any directly attributable deaths was Chernobyl. We will discuss these disasters further in a supplementary article to be added shortly: how they happened, what damage they caused and what the potential is that another could occur at one of the world's 443 nuclear power plants. 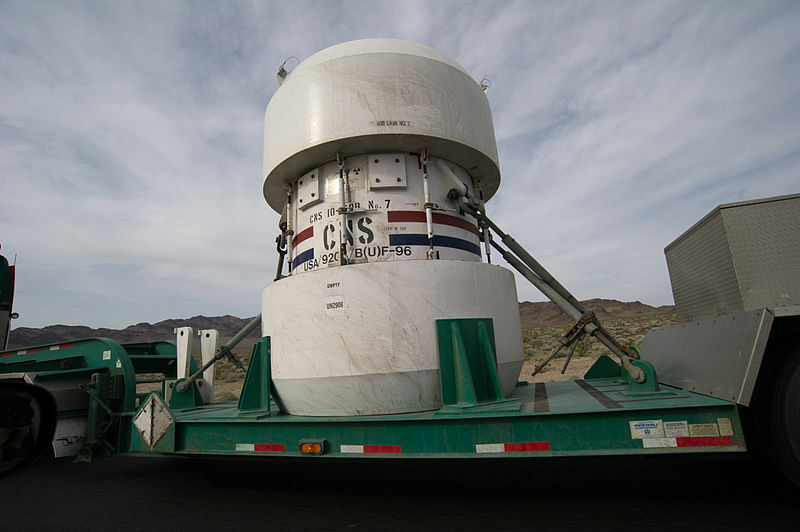 Reinforced radioactive waste container for removing spent fuel from a nuclear power plant in Nevada. Nuclear waste is a major challenge for the nuclear industry. The most dangerous nuclear waste, which scientists estimate must be cooled and shielded from the outside world for tens of thousands of years, are the spent fuel rods (See: How Nuclear Power Works). They contain a number of radioactive isotopes that result from nuclear fission and have varying half-lives, and therefore varying degrees of danger. Iodine-131, for instance, has a half-life of eight days, meaning every eight days it loses half of its radioactivity and after a short time will no longer pose any danger to living things. Iodine-129 on the other hand has a half-life of 15.7 million years. What to do with this nuclear waste is one of the most difficult problems facing the nuclear industry. Most countries with nuclear programs are looking to put the final waste in deep underground repositories that will be protected in perpetuity; none have yet begun to do so. The problem poses a unique ethical dilemma: does our need for energy outweigh the multi-generational commitment we are making in storing this potentially hazardous waste? Can we be sure that the tremendous volumes of radioactive material do not fall into the wrong hands or leak into the atmosphere after an earthquake? It is, after all, impossible to know who or what will be living on Earth in 100,000 years; our oldest civilizations are a mere 6,000 years old. We can perhaps, try and explain the threat to them. At least that's the strategy undertaken by the United States. Their Department of Energy had planned (until recently) on burying their 56,000 tons of nuclear waste below Yucca Mountain, Nevada. Around the site they planned on erecting a wall of salt, 48 monoliths with warnings written in English, French, Russian, Arabic, Chinese, Spanish and Navajo, burying thousands of tiny placards around the area, as well as several buried information centers that employed pictograms to scare away any potential future explorers or archaeologists about the dangers that lay within the mountain. New plants, like the Generation IV plants that are forecast to begin coming online around 2030, will be able to extract energy from a number of radioactive isotopes, and from very diluted quantities of radioactive ores. In fact this means that the nuclear waste created by plants today could be reprocessed and burned in these new reactors. This is why many countries are actually reluctant to bury their nuclear waste in some inaccessible underground vault: that waste may one day be invaluable power plant fuel. This is certainly the case with France, and they appear willing to sit on their nuclear waste until these new plants come online and their waste can be reprocessed again into fuel. The waste created by these new plants will not be nearly as dangerous as that from current, more primitive designs. Though Canada has not yet begun planning such elaborate Stonehenge-like precautions for its nuclear waste, the government has been slowly moving forward on the issue of long-term storage. Currently all of the country's nuclear fuel is stored on-site at nuclear plants in concrete-lined holding pools under three metres of water. This is sufficient to block the harmful radiation effects of the waste and after seven to ten years the fuel bundles have cooled enough to be moved to a dry storage facility. Since each plant produces on average about 27 tons of nuclear waste a year, the amount is adding up quickly. In 2002 the Nuclear Waste Management Organization (NWMO) was created and tasked with deciding what Canada should do with its mounting radioactive stockpiles. The NWMO has recommended a deep geological repository, perhaps in the stable granite formations of the Canadian Shield. There is no timeline to choose a site and the organization recommended taking a gradual approach that builds consensus with all interested parties. The organization is currently designing a process to select a site. Though the rock formations of the Canadian Shield are some of the most ancient and geologically stable in the world, it is impossible to guarantee that any repository site will remain locked away for the thousands of years necessary to let the radioactivity decay away. If the site were to be breached at any point in perhaps as long as 100,000 years, it could prove lethal not only to whoever or whatever is living in the immediate vicinity but for vast distances around. Many opponents of nuclear power question whether this future uncertainty is too high of a price to pay for nuclear power today. The phrase "nuclear renaissance" has entered the public parlance in the past decade or so, a reference to the perceived rebirth of the nuclear industry after the nadir of the post-Chernobyl period. Fighting climate change, meeting soaring future energy demands and finding energy from geopolitically stable regions have all propelled political leaders to advocate for an expansion of nuclear capacity. A 2003 MIT study entitled: The Future of Nuclear Power argued, "We believe the nuclear option should be retained, precisely because it is an important carbon-free source of power." This study helped persuade the U.S. Bush and later Obama Administrations, to openly come out in favour of expanding nuclear power, providing large loan guarantees that underwrote the construction of new plants for the first time since the 1970s. The study postulated a scenario where the 336 reactors, then in operation, would multiply to anywhere from 1,000 to 1,500 globally by mid-century. This could, with the aid of renewables and energy efficiency improvements, eventually replace the fossil fuel economy. In order to achieve this rapid growth, four problems needed to be seriously addressed in the next decade: economic competitiveness, proliferation, dealing with radioactive waste, and safety. Seven years on and unfortunately, none of these problems are anywhere near being solved. The study points out that, as of 2003, nuclear power was not economically competitive with fossil-fuel based forms of electricity generation. Without a carbon tax it is unlikely it ever will be. Since then, despite the fact that fossil fuels have become more expensive, nuclear power has not benefitted. Instead it continues to be handicapped by high construction costs and economic uncertainty. A few major economies implemented carbon taxes, such as India, South Korea and the European Union, but the biggest emitters, China and the United States, have not. As for the proliferation of radioactive materials to terrorists or rogue states, the record is equally bleak. North Korea has detonated two nuclear warheads since 2006, while that country's domestic and diplomatic situation is anything but improving. And despite repeated attempts, the international community is looking increasingly powerless to stop Iran from acquiring a nuclear bomb. Pakistan, with over 100 nuclear warheads, is experiencing alarming political instability. On the plus side there has never yet been a nuclear terrorist attack anywhere in the world. As for nuclear waste, though many countries are planning to seal it deep underground, these plans have been hit by setbacks and controversies. The most notable example is America's Yucca Mountain. Intended as the nation's nuclear waste repository since 1991, the project was entirely cancelled in 2009 thanks to a sustained opposition campaign from local residents and environmentalists. On the other hand, Finland and Sweden have finally selected sites for their repositories in communities that have volunteered for the site, providing some encouragement to the nuclear industry. The final issue—nuclear safety—occupies a lot of headlines. The crisis at Fukushima, though not currently anticipated to cause widespread death or illness, has shown that even advanced economies like Japan, with unequaled experience dealing with natural disasters, cannot fully contain the risks inherent to nuclear power. The crisis has caused the International Energy Agency to halve its estimated increase in nuclear capacity by 2030 and lead a number of countries to review their nuclear safety procedures and expansion plans. For these reasons the plan to use nuclear energy as a central plank of a global climate change strategy appears in doubt. After the first nuclear plant was connected to the civilian electric grid in the Soviet Union in 1964, hundreds of of nuclear power plants have been built and operated around the world, amounting to over 14,570 cumulative reactor years of operation. Construction peaked in the late 1970s and early 1980s and has largely flat-lined since. Few governments have risked stirring up a public outcry by announcing new nuclear power plants since the disaster at Chernobyl. Today nuclear power plants are operated by 31 countries, of which over 80 % of all capacity is in the developed OECD countries. While nuclear power is important to many major economies, only one relies upon nuclear power for more than half of its electricity needs: France. Following the Arab oil embargo in 1973, the French sought to secure their energy independence by aggressively embracing nuclear power. As a French slogan went at the time: "No coal, no oil, no gas, no choice." Today, France operates 68 nuclear reactors that provide the country with 75% of its electricity. While the United States leads the world with over a hundred reactors, the gargantuan size of the American economy means that they still only produce 20% of America's electricity. In the next decade, global nuclear power capacity is set to expand due to the economic rise of China and India. These countries are only in the initial stages of developing civilian nuclear energy capabilities and as of July 2011 Canada still produces more megawatts of nuclear power than the two combined. But the two energy-hungry economies are catching up at an astonishing pace. China already has 27 nuclear reactors under construction, and 160 more in various stages of planning according to the World Nuclear Association. India is building 5 and is planning another 58. 50 Years of Nuclear Energy Factsheet.' International Atomic Energy Association, accessed May 19, 2011. http://www.iaea.org/About/Policy/GC/GC48/Documents/gc48inf-4_ftn3.pdf. Ever since the beginning of the nuclear age, Canada has been at the forefront of nuclear power development. The country's first civilian reactor opened in 1971, and today Canada operates 18 of them: 16 in Ontario, and one each in New Brunswick and Quebec. They are all CANDU reactors, (CANada Deuterium Uranium) a Pressurized Water Reactor design that has been exported to a number of countries including South Korea, China, India, Argentina, Romania and Pakistan. Bruce Nuclear Generating Station near Kincardine, Ontario. Most of Canada's plants were built in the 1960s and '70s, and will be reaching the end of their service lives in the next decade. A plant's 30 to 40 year service life is determined by the wear and tear many essential parts in the plant will suffer over that time period, which could potentially compromise the safe operating of the plant and the safety of its workers. But instead of decommissioning the aging plants, all three provinces are gradually refurbishing them and extending their life spans. Unfortunately, the refurbishment plans have been problematic, with cost-overruns that the World Nuclear Association admits "…In some cases have made it almost as expensive as new construction." Plans have been in the works for some time to build two new reactors at the Darlington plant. The four reactors at Darlington currently provide Ontario with 3,512 MegaWatts of power, about 20% of its electricity. These plans were suspended after the only company to make a bid, Canada's flagship nuclear power company AECL, announced they could only build the plants for double the province's allotted budget. This was not good enough for Ontario's government and the construction of new plants is currently on hold. The frequent cost overruns and poor sales in CANDU reactors in the past five years has led the government to auction off part of the crown corporation AECL to a private Montreal-based engineering firm, SNC-Lavalin. In the West, Alberta is tentatively considering using nuclear fission to help oil sands extraction. There are two broadly similar techniques that could be used, known as cyclic steam stimulation (CSS) and steam-assisted gravity drainage (SAGD). Both essentially require water to be heated, turned into steam and pumped underground. This will heat the bitumen and allow it to flow to the surface where it can be extracted and refined into oil. As natural gas is currently used for this process, using nuclear power to provide the steam might make this in situ extraction cheaper and more carbon friendly in the long term. Ontario-based Bruce Power is considering building a 4,000 MW reactor just outside of Peace River, Alberta, about 130 km over the border from B.C. at either Lac Cardinal or Whitemud. The Peace River as seen from just outside the town sharing the same name. 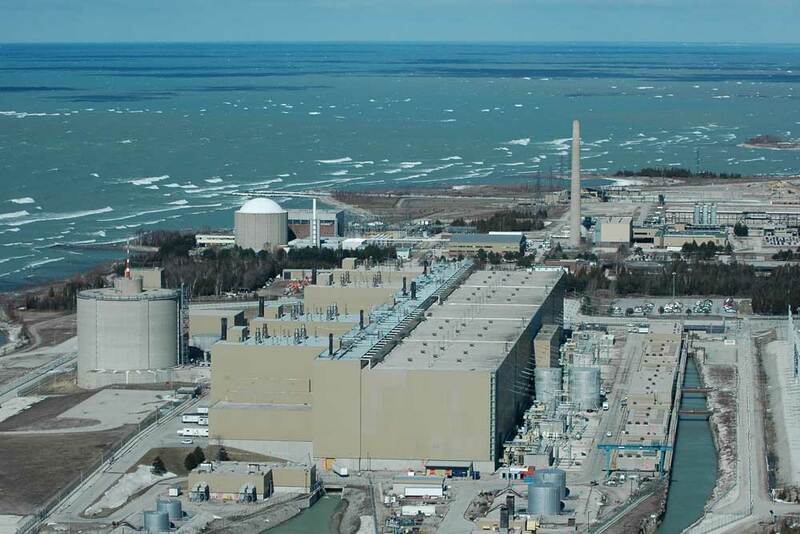 Bruce Power's proposal to build a 4,000 MW nuclear power plant in the region have stalled. The Alberta government maintains that though it is not actively encouraging such plans, it will consider applications from private companies. Typically, the massive long-term investments required to build a nuclear power plant require close cooperation and subsidization from government. The Alberta government's low-profile approach might then be a factor in Bruce Power's decision to wait and see how market conditions in the oil sands develop in the years ahead. It is also addressing concerns about any threat of water contamination of the Peace River. At this pace it is unlikely a nuclear power plant in the tar sands could come online before the decade is out. 'Nuclear Power in Canada.' World Nuclear Association, last modified April, 2011. http://www.world-nuclear.org/info/inf49a_Nuclear_Power_in_Canada.html. British Columbia has never had a nuclear power plant or an uranium mine. Until now, there has not been an outstanding need for this source of energy in the province. BC currently generates 86% of its electricity from hydroelectric power, and the potential exists to generate triple that. Massive long-term investments in electric power are a niche that has already been filled by dams, such as the gigantic W.A.C. Bennett Dam. In light of this, the B.C. Government was in a position to reiterate its desire to avoid nuclear power in the 2010 Clean Energy Act, which aims to "achieve British Columbia's energy objectives without the use of nuclear power." Canada is the world's second-largest uranium producer behind Kazakhstan. Canada also hosts some of the biggest reserves with close to 500,000 tonnes of uranium recoverable, though it is well behind Australia (1,673,000 tonnes) and Kazakhstan (651,000 tonnes). British Columbia, however, is believed to have comparatively little of the country's uranium deposits, which are mostly concentrated in Saskatchewan and the northern territories. In the past BC's reserves were not concentrated enough to make mining economically worthwhile. This has changed as recent rises in uranium prices, combined with the international impetus for a "nuclear renaissance", is beginning to make B.C. 's marginal uranium deposits look more attractive. After a geological study in 2008 the Boss Power Corp. applied for the rights to begin an environmental survey for a uranium mine approximately 50 km south-east of Kelowna at a site they called the Blizzard deposit. Three days later on April 21, the government, belatedly realizing uranium mining could actually happen in the province, issued a ban not only on uranium mining, but on exploration for it as well. The ban on uranium mining continues to remain in place, though many other kinds of metals and coal are mined extensively throughout the province. Boss Power has since argued that the government unlawfully expropriated the land at the Blizzard site, without providing a legal and scientific basis for the moratorium. The company sued the province for compensation and in April 2012 Boss Power received a $30 million settlement from the government out of court, a move that was controversial since it greatly exceeded the provincial government's own estimates of how much money Boss Power could reasonably claim to have lost on the investment. CBC News. 'Uranium mine lawsuit costs B.C. $30M.' October 21, 2011. Accessed May 30, 2012. To ensure continuity of material, all of the external web pages referenced here were cached in May 2012. Readers are recommended to explore the current links for any changes. B.C. Hydro. 'Our Facilities.' Accessed May 19, 2012. B.C. Legislature. 'Bill 17 – 2010: Clean Energy Act. Part 1, Section 2.' Documents of the B.C. Legislature. 2010. Accessed May 12, 2011. Blue Ribbon Commission on America's Nuclear Future. 'Draft Report to the Secretary of Energy.' July 29, 2011. Accessed May 3, 2012. Boss Power Corp. 'Boss Power Provides Update on Progress of Expropriation Lawsuit Against Province of British Columbia.' March 28, 2011. Accessed May 3, 2012. CANDU Owners Group. 'CANDU Reactor FAQs.' Last modified 2011. Accessed May 3, 2012. Chandler, Jo. 'Is This the end of the nuclear revival?' Sydney Morning Herald, March 19, 2011. Accessed May 3, 2012. COMARE. 'Committee on Medical Aspects of Radiation in the Environment: Fourteenth Report.' 2011. Accessed May 3, 2012. Cruickshank, Douglas. 'How do you design a 'Keep Out!' sign to last 10,000 years?' accessed May 3, 2012. Enercon. E-126: State of the Art. Accessed May 12, 2011. European Nuclear Society. 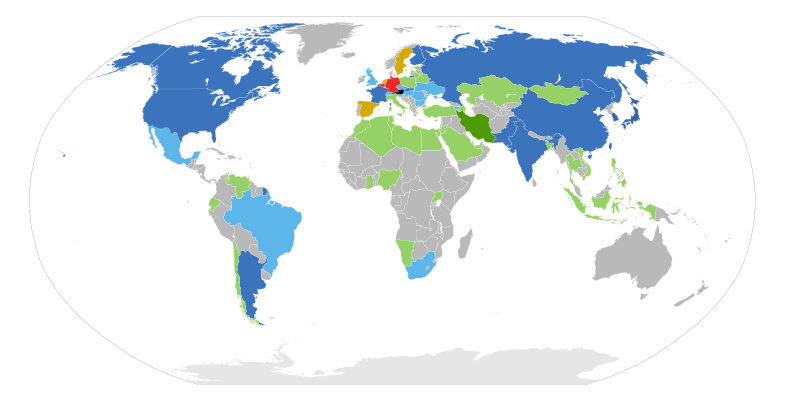 'Nuclear power plants, world-wide.' Accessed May 3, 2012. Fetter, Steve. How long will the world's uranium supplies last?' Scientific American. January 26, 2009. Accessed May 3, 2012. Foreign Policy Magazine. 'Failed States Index 2010. 'June 21, 2010. Accessed 29 July 2010. Gnansounou, E. and Bedniaguine, D. 'Potential Role of Fusion Power Generation in a Very Long Term Electricity Supply Perspective: Case of Western Europe.' Swiss Federal Institute of Technology. Accessed May 3, 2012. Hvistendahl, Mara. 'Coal Ash Is More Radioactive than Nuclear Waste.' Scientific American. December 13, 2007. Government of Alberta: Energy. 'Nuclear Power.' Accessed May 3, 2012. IPCC Fourth Assessment Report. Climate Change 2007: Working Group III: Mitigation of Climate Change, 4.3.2 Nuclear energy. Accessed May 3, 2012. Jacobson, M. & Delucchi, M. 'Providing all global energy with wind, water, and solar power, Part I.' Elsevier Journal. December 30, 2010.
International Atomic Energy Association. '50 Years of Nuclear Energy Factsheet.' Accessed May 3, 2012. Johnson, Keith. 'It's the Economics, Stupid: Nuclear Power's Bogeyman.' Wall Street Journal. May 12, 2008. 'Nuclear Phaseout Is an 'Historic Moment'' Der Spiegel, May 30, 2011, accessed May 3, 2012. Massachusetts Institute of Technology. 'The Future of Nuclear Power: Executive Summary.' Accessed May 19, 2011. Nuclear Waste Management Organization. 'How Nuclear Fuel Waste is Managed in Canada. 'May 19, 2011. Ontario Power Generation. 'Nuclear Power in Ontario.' Accessed May 3, 2011. Organization for Economic Co-operation and Development. List of OECD Member countries. Accessed May 3, 2012. Polson, J., Chipman, K & Chediak, M. Nuclear Renaissance Threatened as Japan's Reactor Struggles. Bloomberg News. March 13, 2011. Accessed May 3, 2012. Stewart, Bob. 'Liberal energy plan includes costly nuclear future for price hike weary consumers.' Kenora Daily Miner and News. January 2011. US Environmental Protection Agency. 'Radiation Protection: Iodine.' Accessed May 3, 2012. US Environmental Protection Agency. 'Calculate Your Radiation Dose.' 2012. Accessed May 3, 2012. Wald, Matthew. 'U.S. Supports New Nuclear Reactors in Georgia.' New York Times, February 16, 2010. Accessed May 3, 2012. World Nuclear Association. 'Waste Management. 'Updated February 2011. Accessed May 3, 2012. World Nuclear Association. 'Supply of Uranium. Accessed May 3, 2012. World Nuclear Association. 'Nuclear Power in Canada Appendix 2: Alberta Tar Sands.' Accessed May 3, 2012. World Nuclear Association. 'Nuclear Power in Canada,' Last modified April, 2011. Accessed May 3, 2012. World Nuclear Association. 'Uranium Mining.' Accessed May 3, 2012. World Nuclear Association. 'Economics of Nuclear Power' Last modified March 9, 2011. Accessed May 3, 2012. World Nuclear Association. Nuclear Renaissance. Accessed May 3, 2012. When no treaty was signed between the government, and no war was fought over the land, first nations groups in Canada are entitled to the land on which they have historically lived and still inhabit. A technique where acidic solutions are pumped into a well, melting away debris about the bottom of the well and allowing the gas to flow more freely. An electrical current that reverses its direction at regularly recurring intervals. Abbreviated to AC. A series of processes in which microorganisms break down biodegradable material in the absence of oxygen. Used for industrial and/or domestic purposes to manage waste and/or release energy. A device used for measuring wind speed. The average speed (and direction) of the wind over the course of a year. Asia-Pacific Economic Cooperation (APEC): A 21-nation group of Pacific-Rim nations that seeks to promote free trade, raise living standards, education levels and sustainable economic policies. Canada is a member. The artificially increased discharge of water during the operation of hydroelectric turbines during periods of peak demand. Small particles released into the atmosphere as part of the flue gases from a coal plant. Fly ash is dangerous for human health but most power plants use electrostatic precipitators to capture it before release. The waters off the Atlantic provinces that has been producing oil and gas since the 1990s, and continues to have considerable untapped oil and gas potential. The region has similar geology to the oil-rich North Sea. 'The ionizing radiation which we are all inescapably exposed to every day. It comes from radon gas in the ground, the sun, distant supernovas, and even elements inside our own bodies. The average exposure is around 361 mrem per year for a person in Washington state (it varies by region). Base-load power is that provided continuously, virtually year-round to satisfy a regions minimum electricity needs. Hydro and nuclear power are well-suited for base-load grid needs. A renewable fuel in which soy or canola oil is refined through a special process and blended with standard diesel oil. Biodiesel does not contain ethanol, but research is underway to develop diesel blends with ethanol. Renewable energy made available from materials derived from biological sources. Natural gas, or methane, that is created by microbes consuming organic matter. Usually found near the Earths surface and is usually immediately released into the atmosphere. Biological material from living, or recently living organisms such as trees, grasses, and agricultural crops. As an energy source, biomass can either be used directly, or converted into other energy products such as biofuel. A facility that integrates biomass conversion processes and equipment to produce fuels, power, and chemicals from biomass. The biorefinery concept is analogous to petroleum refineries, which produce multiple fuels and products from petroleum. Bitumen is "petroleum that exists in the semi-solid or solid phase in natural deposits. Bitumen is a thick, sticky form of crude oil, so heavy and viscous (thick) that it will not flow unless heated or diluted with lighter hydrocarbons. At room temperature, it is much like cold molasses." Bottom Ash: Bottom ash are small particles that result from coal combustion, but unlike fly ash they are too heavy to be released into the atmosphere and must be stored. Canadian Environmental Protection Act: Passed in 1999, CEPA is "An Act respecting pollution prevention and the protection of the environment and human health in order to contribute to sustainable development." Cap and Trade: A system where the government sets a limit on how much of a pollutant may be emitted. It then sells the rights to emit that pollutant to companies, known as carbon credits, and allows them to trade the credits with other companies. The EU has implemented a cap and trade program for carbon dioxide. Carbon Footprint: A calculation based on the set of greenhouse gas (GHG) emissions caused by an organization, event, product, or person. Carbon Sink: A carbon sink is a natural or artificial reservoir that accumulates and stores carbon-containing chemical compounds for an indefinite period. Carbon Monoxide: A deadly gas produced from the tailpipe of cars that burn gasoline. Capacity Factor: The ratio of the actual output of a power plant over a period of time and its potential to output if it had operated at full nameplate capacity the entire time. Cellulose: An organic compound consisting of several hundred to over ten thousand linked glucose units. Cellulose comprises the structural component of the cell wall in plants, many green algae. It is the most common organic compound on Earth comprising about 33% of plant matter. Cellulosic Biomass: Fuel produced from wood, grasses, or the non-edible parts of plants that is mainly comprised of cellulose. Cellulosic Feedstock: The inedible cellulose which comprises most plants and trees. Yields are much higher as any part of the plant can be used and because they do not compete with food, therefore, cellulosic feedstock is an ideal candidate for large scale sustainable biofuel production. Cetane Rating: Also known as cetane number (CN), this is a measurement of the combustion quality of diesel fuel during compression ignition. It is a significant expression of diesel fuel quality. Clean Power Call: A request sent out by B.C. Hydro to private power utilities for new electricity-generating projects totalling 5,000 GWh/year. B.C. Hydro will help fund the successful projects and then buy power from them once completed. How efficiently a turbine converts the energy in wind into electricity. Just divide the electrical power output by the wind energy input. Using the energy left over from one primary energy conversion to fuel another. The most prominent example of this are natural gas co-generation plants which first feed fuel into a gas turbine. The residual heat from that reaction then heats water to spin a steam turbine. Collector Area: In solar thermal energy collectors, the Collector Area refers to the area that intercepts the solar radiation. A mixture of hydrocarbons present in natural gas. When gas is lowered below the hydrocarbon dew point, a condensate, that is, a liquid, forms. These can be used for combustion just like oil and gas. These are also known as natural gas liquids. Generation of electricity using fossil fuels. Gas reserves that form beneath porous layers of sandstone. Until recently this has been the only kind of gas commercially extracted. When bituminous coal is baked at high temperatures it fuses together ash and carbon, creating coke. Coke can then be used to reduce the oxygen content of iron, strengthening it and creating steel. A force generated by to the earths rotation which deflects a body of fluid or gas moving relative to the earths surface to the right in the northern hemisphere and to the left in the southern hemisphere. It is at its maximum at the poles and zero at the equator. Decentralized Electricity Generation: Decentralizated electricity generation is a concept used to describe a large number of dispersed energy generators, often closely integrated with the people that use the electricity. Wind turbines and solar panels are good examples: they can be put within communities, be owned by members of the community and generate electricity for it. Alternatively centralized energy generation, far more common in North America, is where a small number of large plants owned by utility companies (hydro-electric, nuclear or fossil fuel) generate large quantities of electricity. The portion of the oil business that involves refining the crude oil, bringing it to market and selling it. Gasoline service stations are the most lucrative part of downstream operations. Effluents: Gases or liquids released by a human-made structure, in this case flue gases from a coal-fired power plant. Electrolyte: Usually a solution of acids, bases, or salts, electrolytes are substances with free ions which make them effective electrical conductors. Electrolysis: A simple technique for splitting water atoms to obtain hydrogen, driven by an electrical current. Requirements that set specific limits to the amount of pollutants that can be released into the environment by automobiles and other powered vehicles, as well as emissions generated by industry, power plants, and small equipment. Transforming one form of energy into another. Most energy conversions that run our economy are conversions from a primary source to electricity (wind or nuclear) or movement (oil). Energy Currency: Energy that is usable for practical purposes. These include electricity and petroleum which power appliances and vehicles. A measurement of the amount of energy stored in a given volume. Energy Return On Investment (EROI): This is the ratio of usable energy obtained over the amount of energy required to get it. The oil sands has a low EROI because instead of being sucked out of the ground in liquid form the oil must be painstakingly mined and heavily refined, a process that requires large quantities of energy itself. An energy source is the means by which energy is generated. The energy profiles each deal with a different source of energy, and most are simply means to attain the energy currency we all use: electricity. Enhanced Geothermal System: A new technology, EGS does not require natural convective geothermal resources, but instead can draw power from the ground through extremely dry and impermeable rock. The provincial Environmental Assessment Office is a politically neutral agency tasked with reviewing major construction projects in B.C. Their purview includes assessing the environmental, economic, social, heritage and health effects over the lifecycle of projects. A blend of ethanol and diesel fuel. plus other additives, designed to reduce air pollution from heavy equipment, city buses and other vehicles that operate on diesel engines. A policy device that encourages investment in renewable energies, usually by guaranteeing power producers that their energy will be bought. In food processing, fermentation is the conversion of carbohydrates to alcohols and carbon dioxide or organic acids using yeasts, bacteria or a combination thereof, under anaerobic conditions. In simple terms, fermentation is the chemical conversion of sugars to ethanol. A finite, or non-renewable resource, is one where a limited amount exists. Once the existing stocks of that resource are exhausted there will be no more, at least in any reasonable human time scale. Only so much fossil fuels and uranium exist on earth, making these finite, non-renewableresources. The wind, sun and tides are renewable resources since it is impossible to run out of them. First Generation Renewable: Well established renewable technologies that emerged early on in the Industrial Revolution. These include hydropower, biomass combustion and early geothermal power. Fission is a nuclear reaction where a heavy atom is hit by a neutron, causing it to split into lighter atoms, release more neutrons, and huge amounts of energy. Flat-plate collectors are a type of non-concentrating solar energy collector, typically used when temperatures are below 200 degrees F. They are often used for heating buildings. Flex-Fuel Vehicle: Also known as a dual-fuel vehicle, this is an alternative fuel vehicle with an internal combustion engine designed to run on more than one fuel, usually gasoline blended with either ethanol or methanol fuel. Flue gases are the gases that are released into the atmosphere by a flue, or pipe, from the steam boiler. Many biofuel feedstocks such as corn, sugarcane, and soybeans are also key sources of food for millions of people. Production of crops for bioenergy may displace other food-related crops, increasing the cost and decreasing the availability of food. The central question is one of ethics: Should we use our limited land resources to grow biofuels when the same land could be producing food for people? Fracking: Hydraulic fracturing is the process of injecting high pressure fluids into deep, geologic formations, in order to fracture the rock and render it more permeable. Fuel Crops: Crops grown specifically for their value as fuel to make biofuels or for their energy content. Fumaroles: Openings in the Earths crust that emit steam and gases. Gasohol: Otherwise known as fuel ethanol, gasohol has been distilled and dehydrated to create a high-octane, water free alcohol. All water must be removed because a water-alcohol mixture cannot dissolve in gasoline. Fuel ethanol is made unfit for drinking by adding a small amount of a noxious substance such as gasoline. Geothermal Gradient: The rate at which temperature increases deeper into the earth, towards the earth's molten core. Geothermal Task Force Team is a government program that aims to: develop policies, in collaboration with affected agencies, related to tenure issuance, examine the regulation of the use of geothermal resources not currently covered by legislation, build a royalty and resource rent model for geothermal resources, and develop a science based review of the known geothermal resources in the province. Geyser: Springs characterized by intermittent discharge of water ejected turbulently and accompanied by steam. Giromill Turbine: Uses lift forces generated by vertical aerofoils to convert wind energy into rotational mechanical energy. They are powered by two or three vertical aerofoils attached to a central mast by horizontal supports. Glut: A situation where the market has been flooded with goods and there is more supply than there is demand causing the price of goods to drop. Gravity Survey: A technique of measuring minute changes in the Earths gravity field. This allows geologists to map lighter and denser rocks underground. Green Energy and Green Economy Act of 2009: Legislation by the province of B.C. to boost the investment in renewable energy projects and increase conservation, create green jobs and economic growth in Ontario. Part of Ontario's plan to become a leading green economy in North America. Head: The term head refers to the change in elevation of the water. Head Differential: The difference in pressure due to the difference in height of water level. Heat Exchangers: These are used in High-Temperature and Low-Temperature applications to transfer heat from one medium to another. In Low-Temperature Geoexchange systems they are built into the heat pump. Horizontal Axis Wind Turbine (HAWT): Horizontal Axis Wind Turbine. These are the most common types of wind turbines and look like aircraft propellers mounted atop towers. Hydrocarbons: A compound of almost entirely hydrogen and carbon. This covers oil and natural gas. Coal, the third fossil fuel, contains so many impurities it is usually disqualified from this title. Hydrostatic Head: The distance a volume of water has to fall in order to generate power. Intermittent Energy Source: Any source of energy that is not continuously available due to a factor that is outside of direct control (ex. Wind speed or sunshine). An internal combustion engine operates by burning its fuel inside the engine, rather than outside of it, as an external, or steam engine does. The most common internal combustion engine type is gasoline powered, followed by diesel, hydrogen, methane, and propane. Engines typically require adaptations (like adjusting the air/fuel ratio) to run on a different kind of fuel than they were designed for. Four-stroke internal combustion engines (each stroke marks a step in the combustion cycle) dominate the automotive and industrial realm today. Kinetic Energy: The ability of water falling from a dam to do work, that is, to generate electricity. Water stored above a dam has potential energy which turns to kinetic energy once it begins to fall. 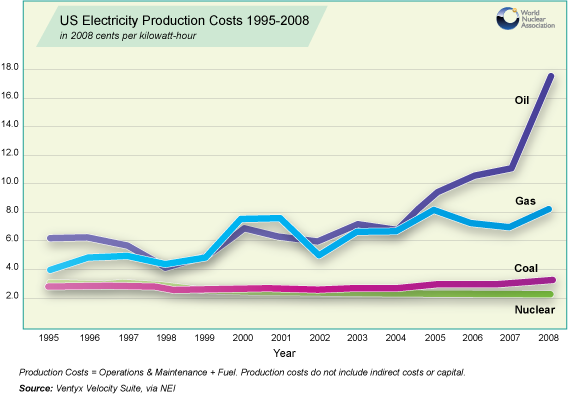 Levelized Cost of Electricity: The cost of generating electricity (capital, operation and maintenance costs). Measured in units of currency per unit of electricity (ex. kWh). Magnetic Survey: A technique for measuring the intensity of magnetic fields from several stations. Manhattan Project: The massive Anglo-American-Canadian scientific undertaking which produced the atomic bombs that helped end the Second World War. It marked the birth of the nuclear age and scientists were immediately aware of the potential to use use nuclear power for civilian use. Market Penetration: The share of the total energy market a specific energy source has in relation to its competitors. So the market penetration of wind power would be measured by its share of the electricity market, while ethanol would be compared to other vehicle fuels, not to total primary energy use. Matrix: In geology, this is the finer mass of tiny sediments in which larger sediments are embedded. Methanol: Methanol is produced naturally in the anaerobic metabolism of many types of bacteria, and is ubiquitous in the environment. Methanol is toxic in humans if ingested or contacted on the skin. For its toxic properties and close boiling point with ethanol, that it is used as a denaturant for ethanol. Miscanthus: A low maintenance perennial grass which is thought to be twice as productive as switch grass as it has a longer growing season, greater leaf area, and higher carbon storage per unit of leaf area. MMBtu: A unit of measurement which means a million Btus (British thermal units). A Btu is roughly the amount of energy it takes to heat a half kilogram of water from 3.8 to 4.4 Â°C. MBtu is used for a thousand Btus. Moderator: A moderator is used to slow down neutrons, which enables them to react with the atoms in the nuclear fuel. If enough atoms react then the reactor can sustain a nuclear chain reaction. M Mount St. Helens is an active volcano located in Washington state. It is most famous for its catastrophic eruption on May 18, 1980 where fifty-seven people were killed, 250 homes, 47 bridges, 24 km of railways, and 298 km of highway were destroyed. Mud-Pools: Pools of bubbling mud. Also known as "paint-pots" when the slurry of usually grey mud is streaked with red or pink spots from iron compounds. Nacelle: The housing atop a wind turbine that holds the gearbox, generator, drive train and brakes, as well as the rotors. Name-Plate Capacity: The intended full-load sustained output of a power plant. For example an average wind turbine's name-plate capacity is 2 Megawatts. The capacity factor is the actual output, so for that 2 MW wind turbine with an efficiency of around 30-35% (average) then it has a more realistic capacity of around 0.7 MW. Most power stations are listed in terms of their nameplate capacity. National Energy Board: A regulatory agency established by the federal government in 1959 that is primarily tasked with regulating oil and gas pipelines that cross provincial and national borders. National Energy Program: A set of policies enacted in 1980 that sought to make Canada energy independent. Petro-Canada was created and oil prices were kept artificially low to protect consumers. Shares of oil revenue were diverted to the federal government who used them mostly in the eastern provinces to offset a decline in manufacturing. The program was extremely unpopular in western Canada and was discontinued shortly thereafter. Nuclear Renaissance: A term used by politicians and the media for the renewed interest in nuclear energy in the past decade. Many countries are now expanding their civilian nuclear programs. Octane: The octane rating of a fuel is indicated on the pump – using numbers such as 87, 90, 91 etc. The higher the number, the greater the octane rating of the gasoline. Oil in Place: The total hydrocarbon (oil and gas) content of a reservoir. Sometimes called STOOIP or Stock Tank Original Oil In Place. Oil Patch: A term for the Canadian oil industry. This specifically means the upstream operations that find and extract oil and gas, mostly in Alberta but also B.C., the other prairie provinces, Newfoundland and Labrador. Oil Window: The range of temperature at which oil forms. Below a certain temperature and kerogen will never progress to the form of oil. Too high and natural gas is formed instead. OECD: The Organization for Economic Co-operation and Development is a 34 country organization dedicated to advocating democracy and the market economy. Membership is largely limited to Western Europe, North America, Australia and Japan, what are often considered the world's developed nations. Sometimes referred to in the media as the "rich countries' club". Passive Seismic Survey: A way to detect oil and gas by measuring the Earths natural low frequency movements. Peak Power Demand: Power demand varies over minutes, hours, days and months. Peak power demand are the times when the most people are using the most power. To meet this demand extra sources of power must be switched on. Some forms of electricity generation, such as natural gas turbines, can be turned on quickly to meet peak power demand and are better suited for this purpose than others, such as nuclear, which are better as sources of baseload power. Permeability: A measure of the ability of a porous rock to allow fluids to pass through it. High permeability in the surrounding rocks is needed for the formation of gas reserves. Photovoltaic Cell: A non-mechanical device typically fabricated from silicon alloys that generates electricity from direct sunlight. Pickens Plan: Investment of $1 trillion into wind power in the U.S.A., named for an American oil tycoon. The plan aims to reduce the amount of foreign oil imported to the U.S.A. while providing economic and environmental benefits. Pondage: The main difference between small and large hydro projects is the existence of stored power in the form of water which is held back by dams at large hydro stations. Some small hydro projects have pondage, however, which are small ponds behind the weir of a dam which can store water for up to a week. Potential Energy: The energy stored in a body or a system. Porosity: Closely related to permeability, this is a measure of the amount of "voids," or empty space in a rock where gas or oil can pass through to collect in a reservoir. Possible Reserves: Possible reserves are a class of unproven reserves that geologists use for oil that they are only 10% sure is present in the ground. Purchasing Power Agreement: A contract between two parties, one who generates power for sale, and another who is looking to purchase it. B.C. Hydro buys power from companies that build their own power generating stations. Primary Battery: A primary battery is one that is non-rechargable because the electrochemical reaction goes only one way. It gives out energy and cannot be reversed. Primary Gas: The degeneration of decayed organic matter directly into gas through a process called "thermal cracking." This is opposed to secondary gas which is formed from decayed oil that has already formed. Probable Reserves: Probable reserves are a class of unproven reserves that geologists use for oil or gas that they are at least 50% sure is actually present. Proven Reserves: An amount of a resource any resource to be dug out of the ground (oil, coal, natural gas or uranium in energy terms) that geologists have a 90% or higher certainty can be extracted for a commercial gain with the technology available at the time." Recompleted: The process, by which an old oil well is redrilled, fractured, or has some other technology applied to improve the amount of oil recovered. Reforming: In oil refining, reforming is using heat to break down, or crack, hydrocarbon atoms and increase their octane level. This technique creates some left-over hydrogen which can be collected and used. Renewable Portfolio Standard (RPS): Law that requires electric utilities to produce some portion of their power from renewable sources like wind, solar, geothermal or biomass. RPSs are necessary to keep renewables competitive in an era of cheap natural gas electricity. Rent-Seeking: The practice of using resources to compete for existing wealth rather than to create new wealth, often to the detriment of those who seek to reform societies or institutions. Economies that fail to diversify away from oil are often pre-dominated by a rent-seeking mind-set where people become more pre-occupied with securing the windfall resouce profits for themselves, usually oil, rather than seeking to develop new industries. Reserves: The fraction of the oil in place that can be considered extractable. This depends not only on the geology, but the economics (is oil expensive enough to make extracting it profitable?) and technology. Reserve Growth: When an oil or gas field is first discovered, reserve estimates tend to be low. The estimates of the size of the field are expected to grow over time and this is called reserves growth. Ring of Fire: The Pacific Ring of Fire is a region of high volcanic and seismic activity that surrounds the majority of the Pacific Ocean. This region is essentially a horseshoe of geologic activity, characterized by volcanoes, earthquakes, deep sea trenches, and major fault zones. Riparian: The term riparian refers to the wetland area surrounding rivers or streams. A riparian ecosystem refers to the biological community supported by an area around a river. Savonius Turbine: Uses drag generated by the wind hitting the cup, like aerofoils, to create rotation. Second Generation Wind Turbine: Technology that is only now beginning to enter the market as a result of research, development and demonstration. These are: solar, wind, tidal, advanced geothermal and modern bioenergy. Much hope has been placed upon these technologies but they still provide only a fraction of our energy. Secondary Battery: Rechargable batteries are sometimes known as secondary batteries because their electro-chemical reactions can be reversed. Secondary Gas: When oil is subjected to so much heat and pressure it degenerates into gas. The process through which this happens called "thermal cracking." Secondary Recovery Schemes: When so much oil has been sucked out of an oil reservoir it will lose pressure and the oil will no longer flow out of the reservoir from natural pressure. When this happens secondary recovery schemes can be employed. This means that fluids or gases are pumped into the well to increase pressure and push the remaining oil up out of the well. Shale: A type of sedimentary rock with low permeability, which was once thought to prevent any commercial extraction of the gas inside. Fracking allows gas developers to access it. Sound Navigation and Ranging (SONAR): Initially devised as a technique for detecting submarines. An emitter sends off pulses of sound. The pulses bounce off objects and return to a receiver which interprets their size and distance. Spot Market: A market where commodities are traded for immediate delivery. A future market on the other hand is one where delivery is expected later on. Because of the dependence of gas users on those who are at the other end of the gas pipeline, the natural gas market is mostly a futures market. Steam Coal: Steam coal is coal used for power generation in thermal power plants. This is typically coal that ranges in quality from sub-bituminous to bituminous. Straight Vegetable Oil (SVO): Vegetable oil fuel. Most diesel engine vehicles can run on it so long as the viscosity of the oil is lowered enough for complete combustion. Failure to do this can damage the engine. SVO is also known as pure plant oil or PPO. Strategic Petroleum Reserve: An emergency store of oil maintained by some governments and corporations. The U.S. Department of Energy holds 727 million barrels of oil. Supercritical Power Plant: Supercritical plants are coal powered power plants that can sustain temperatures of 550ËšC to 590ËšC and transfer up to 40% of the coals energy into power. This technology has only come into use in recent years. Most new coal-fired power plants built in the West are supercritical. Switchgrass: One of the dominant native species of the North American prairies, tallgrass is being researched as a renewable bioenergy crop. It is a a native perennial warm season grass with the ability to produce moderate to high yields on marginal farmlands. Thermal Power Plant: A thermal power plant is any that is powered by a steam turbine. The steam is created by heating water which in turn spins the turbine. Most coal and gas power stations operate in this way, as do all nuclear plants. Coal powered and gas plants are often just called thermal plants. Total Carbon Cost: The amount of carbon dioxide emitted during an action or a process. One exmaple is building a natural gas plant. The total carbon cost would include everything from the carbon emitted to get the materials to build the plant, to the carbon emitted in the building of the plant, and the carbon emitted during the operation of the plant. Unconventional Gas: Unconventional gas reserves come in many different geological formations, and include tight gas, shale gas, coalbed methane and methane hydrates. Extraction of these sources has only just begun and has hugely extended the lives of many gas fields and unlocking many new ones. The unlocking of unconventional gas reserves in the last five years has revolutionized the global energy system. Ultracritical Power Plant: These are coal thermal power plants that operate above 590ËšC and can attain efficiencies above 40%. These plants are just coming into service. United States Geological Survey (USGS): The United States Geological Survey. The department responsible for estimating American fossil fuel reserves. They also conduct many studies that span the globe. Unproven Reserves: Oil reserves in the ground that petroleum geologists are less certain are there, but have strong reason to believe is present. Unproven reserves can be broken down into probable reserves and possible reserves. These numbers are used within oil companies but not usually published. The portion of the oil business that involves finding oil and extracting it. Uranium is a heavy metal that is naturally radioactive. An isotope, U-235 can be enriched to support a nuclear chain reaction. Uranium is used in many nuclear power plants. A 2,730 MW dam built in north-eastern British Columbia along the Peace River during the 1960s. Any activity where humans bore down into the Earth to access reserves of oil or gas trapped in underground geological formations. These are produced from wood residue (like sawdust) collected from sawmills and wood product manufacturers. Heat and pressure are used to transform wood residue into pellets without chemical additives, binders or glue. The pellets can be used in stoves and boilers. A remote mountain in Western Nevada where the U.S. Department of Energy has planned on storing all of the country's spent nuclear fuel underground since the 1990s. The proposal met stiff opposition from local residents and in 2009 the project was cancelled. Energy BC is a comprehensive and objective resource on energy sources, uses and issues in British Columbia. The project has been developed by Dr. Michael Whiticar at the University of Victoria.